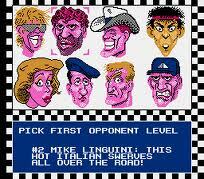 who can race their way across the United States of America. Each racer uses the same modeled car, but with varying Top Speeds. # Lance Slick: He's known for his cool moves and a hot foot! # Mike Linguini: This hot Italian swerves all over the road! # Derrick Stetson: A tough Texan who herds racers just like cattle! # Ito Speedo: This black belt driver will blow your doors off! # Va-Va Vroom: She's the top female racecar driver in the world! # Pierre Sedan: He'll block your pass every time in high style! # Hans Von Brakemann: Get too close to him and you're history! # AJ Turbo: There's no foolin' around with AJ! He's the king of the road! car. The best way to face cars in turns is to be on the inside. reach his top speed again. 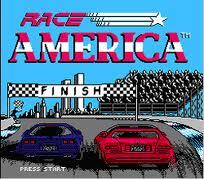 Race America is one of the few arcade races on the NES platform that has the potential to keep you hooked in for hours at an end with its quality gaming and action-packed plot. With Suns and Roses' Paradise City playing in the background during the opening screenshot, this game will take you back to the time where graphics were not the only criteria for racing to be fun! the tracks list, that i just could not remember after over 4 years of not playing the game.